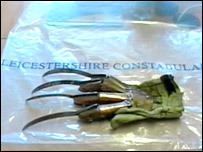 A man obsessed with the horror film character Freddie Krueger used a home-made bladed glove to slash his sleeping friend. Jason Moore, 37, of Bulwer Road, Leicester, was jailed for life by a judge at the city's crown court. 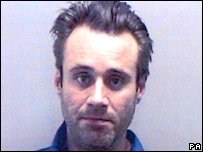 After taking a sleeping pill, John-Paul Skamarski woke to find himself being attacked by Moore in August 2006. A Leicestershire Police spokesman said they were pleased with the conviction in this "extremely unusual" case. Jailing Moore for a minimum of four-and-a-half years, Judge Michael Pert said: "You are an extremely dangerous man. "You are obsessed in particular with the Freddy Krueger figure in Nightmare on Elm Street. "What you were fascinated with was using that glove to kill someone. The person you chose was your friend who was asleep and had no reason to expect an attack." Krueger was a serial killer character who appeared in the Nightmare on Elm Street films. He was able to attack victims from within their own dreams. Actor Robert Englund became famous for his depiction of Krueger, who wore a fedora hat and was armed with a metal-clawed leather glove. The court heard Moore had watched Nightmare on Elm Street 20 times. He watched it just before the attack in August. Moore and Mr Skamarski had been drinking cider together at Moore's home in the early evening of 30 August 2006 when Mr Skamarski fell asleep on the sofa. He woke up to find Moore slashing at him with the glove and a 10in bread knife. During a 10-minute struggle, Skamarski suffered four cuts to his face, cuts to his hand and a 1in stab wound to his chest. Moore said he could not remember the attack and said although he had made the glove, he never intended to use it. Philip Gibbs, defending, said Moore had accepted he was a dangerous man. "He has only ever wanted to understand his actions," he said. "He is a very damaged individual." He fashioned the weapon - said to be a "labour of love" for Moore - from a leather gardening glove with four "cut throat" blades welded into brass housings. Speaking after the trial, Det Sgt Gary Rogers from Leicestershire Police said the glove was one of the most frightening weapons he had ever seen. "A lot of skill has gone into creating that glove. I have seen some horrific weapons in my life and that is probably the most horrific I have seen."